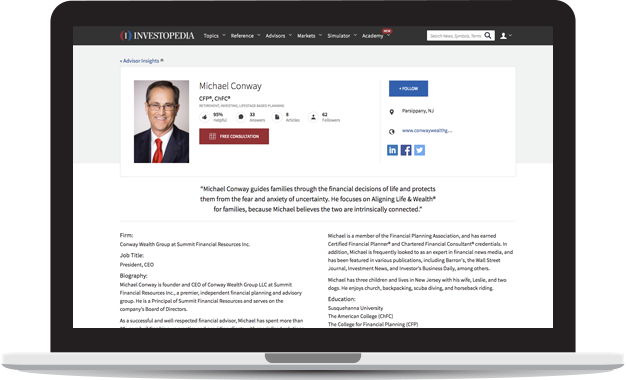 Advisor Insights is Investopedia’s free content marketing and lead generation platform for financial advisors. By joining, you can connect with our millions of readers by answering their questions, and publishing thought leadership articles. It’s completely free. Publish tailored financial guidance to investor questions and thought leadership articles to broadcast your knowledge online. Stand out in Google searches and through promotion across Investopedia, Business Insider, CNBC, Yahoo Finance, MSN, and Facebook. Build your business with vetted leads from Investopedia’s readership and free services like a professionally filmed marketing video. A personalized profile page highlights your experience and displays all of your advice to 27+ million investors. Your answers to questions from readers about their finances will allow investors to find your practice and learn from your expertise. 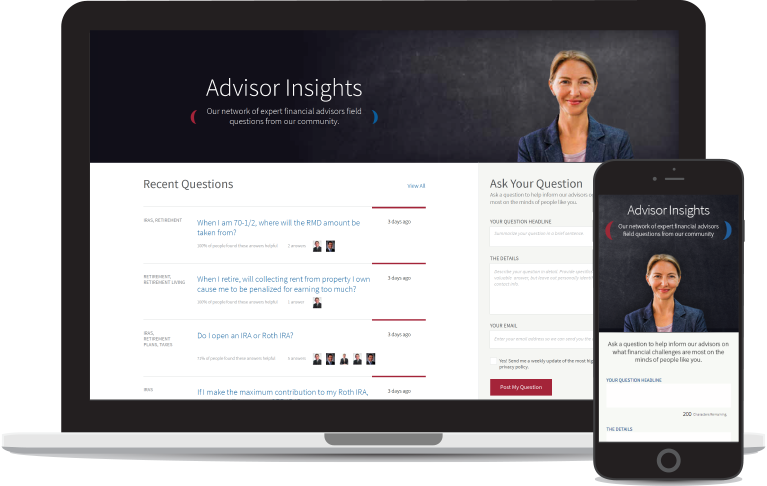 Gain valuable services as you publish on Advisor Insights. Unlock tools to further promote your business at each milestone. All completely free. 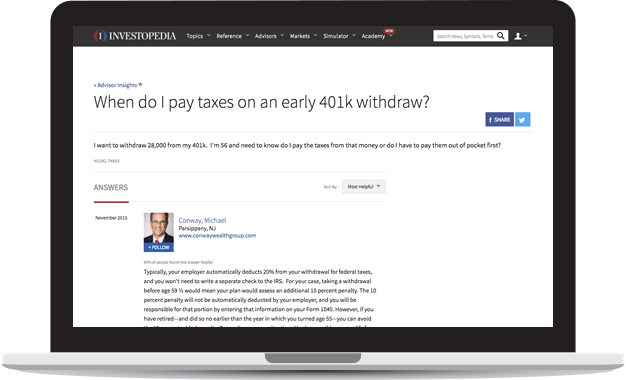 Get notified when top tier reporters are searching for financial advisors to quote or interview for an article. Receive a complimentary marketing video to promote your practice, professionally filmed at your office. Select your favorite term to be featured in Investopedia’s Term of the Day newsletter, sent to nearly 1M subscribers. 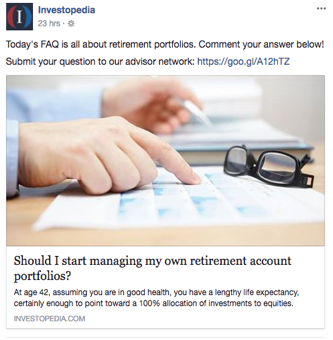 Promote your practice by running 50,000 impressions of display ads on Investopedia, geo-targeted to your area. "...is an effective platform for building national brand recognition and differentiating from peers." "...provides an excellent forum to engage with prospects and clients, offer valuable financial insight, and build trust between advisors and investors." "...helps increase visibility and build trust. It's the ideal platform to engage and empower consumers." Join leading financial advisors and broadcast your expertise to millions of investors, while gaining valuable insights into their search habits and most frequently asked questions. It’s free.